Trek through dormant volcanoes in search of mountain gorillas. Watch golden monkeys leap tree to tree in Parc National des Volcans. 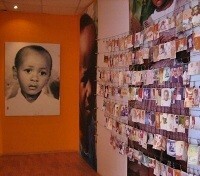 Discover the heart aching past of Kigali at the Genocide Museum. Featuring expertly selected hotels & eco-lodges. Safari deep into the heart of Africa to come face to face with some of the world's last remaining mountain gorillas. Their sheer size and humanlike interactions will leave you spellbound. 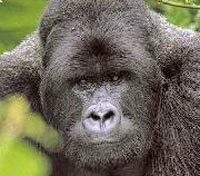 NOTE: Gorilla permits are secured with you trip's deposit. Once secured they are non-refundable. It will take 24-48 hours to secure the purchase from the authorities as they are sold on a first come first served basis. The park authority/management reserves the right to cancel any permit without any refund or further reference. Meet your private assistant and driver for an airport transfer. While you are in our care your safety and security are our number one priority. As such, in the unlikely event of serious illness or injury, all clients are covered by “Akagera Aviation EMS” Evacuation Service. This is mandatory for anyone traveling to Rwanda. The policy covers the cost of the evacuation flight back to Kigali for treatment. This insurance policy however DOES NOT cover the cost of any medical treatment received. We highly recommend travel insurance for full coverage. The Serena Hotel is considered the best hotel in Kigali. Meeting and surpassing the already high standards set by the luxurious Serena Hotel chain is no easy feat. 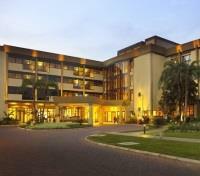 The Serena Kigali manages this with its 104 rooms and suites, each individually immaculate, clean, and refined in decor. Dining is a treat, where one will never get sick of the extensive menus, created to please all guests. Staff is always available, friendly, and hospitable, offering incomparable service and care. Activities include the swimming pool, shopping, and fully equipped gym. On some nights, the hotel even has live music playing at the poolside. 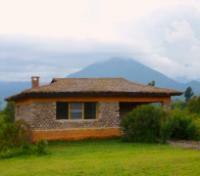 The Mountain Gorilla View Lodge is an ecolodge that is perfectly situated for gorilla tracking in Rwanda. The 30 individual cottages have been built on 4 acres of land on the slopes of Mount Karisimbi, one of the volcanic mountains that makes up a part of the Virunga Massif. The stone and thatch cottages each have en suite facilities, a small lounge with a fire place, and a private veranda. The cottages are sizable and are positioned to provide each cottage with space for privacy. There is a separate restaurant and bar area where meals are served using local produce. Mountain Gorilla View Lodge provides good value for money with the luxury of great views and easy access to Parc National des Volcans. The Parc National des Volcans is located in the Virunga Mountains, a magnificent chain of dormant volcanoes in the North of the country. This area is home to the world’s last surviving mountain Gorilla populations, currently a mere 700 individuals. After breakfast, you will depart the lodge and drive for approximately 1 hour to the Park Headquarters where you will meet with excellent local guides and trackers who will provide an informative session on the etiquette of gorilla trekking. After the session, the hike into the forest begins. 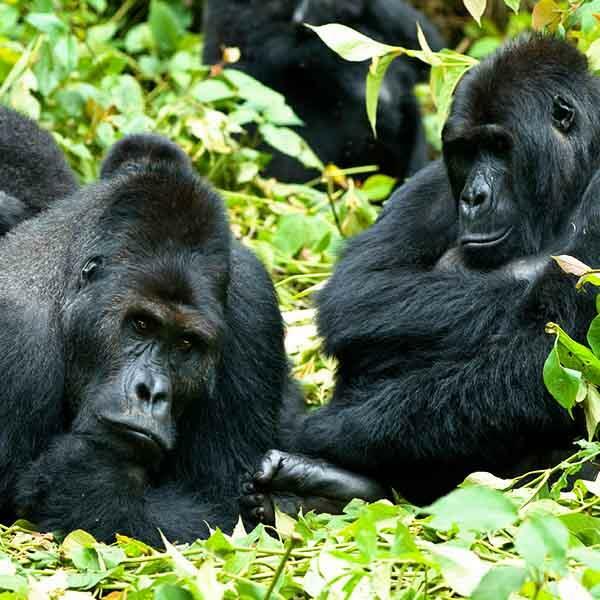 A full day trek with your guide through the park is a reasonably strenuous activity which can last the morning or all day as you seek out the gorilla families. 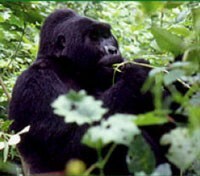 The guide will take you to where the gorillas were seen the night before and begin to track them from that point. 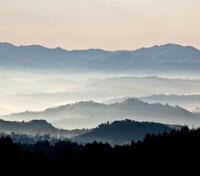 The trekking can take from 1 to 6 hours and climb to altitudes, not in excess of 7,500 feet. The terrain is rough and at times quite muddy. Once the gorillas are located all the aches and fatigue of the trek are forgotten, as the experience is often described as finding a hidden natural treasure in the midst. Viewing time is limited to one hour, and only 8 maximum are allowed per group. Visitors are asked to maintain a distance of 7m (about 22 feet) from the gorillas. Cameras and plenty of fast speed film are recommended. It can rain at any time in the forest, so waterproof clothing is recommended for you, your cameras and film. Please note that plastic (e.g. carrier/shopping) bags are illegal in Rwanda. Kids under age 15, or people sick with a cold, flu or other contagious illness, are not allowed to visit the gorillas. Enjoy a full day with your private vehicle and English speaking guide exploring Parc National des Volcans and all it has to offer. Golden monkeys are a local subtype of the blue monkey which are endemic to the Albertine rift and live in the montane forests of the Volcanoes National Park area of Rwanda. There is currently 2 groups of habituate golden monkeys in Volcanoes National Park, also popularly known as Parc de National Volcans. 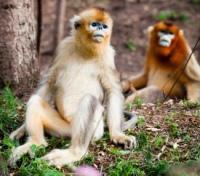 Each of the habituated golden monkey groups has between 80-100 members in each troop. The golden monkeys are a very playful and inquisitive primates which are habituated to human presence and will usually act up the presence of human visitors leaping from tree to tree as they feed on the bamboo shoots in the forest. Only open for visitors since June 2003, enjoy a rare treat watching these unique primates play and perform in the forest. Like with gorilla trekking, golden monkey trekkers are required to assemble at PNV park headquarters at 07:00am for pre-tracking briefing. The park guides will lead into the forest for the search of the golden monkeys. The golden monkeys are mostly found at the foot of Mt Sabyinyo. Golden monkey tracking is generally less arduous and less challenging that the gorilla trek. A private vehicle with English speaking driver will provide a transfer today from Parc National des Volcans to Kigali. The approximate travel time is 3 hours.